The Red Bellied Woodpecker is a year round resident in New Hanover and surrounding counties. It's name comes from a slightly red patch of feathers on it's stomach (and in case you are wondering why it's not called the red headed woodpecker- there is already a bird with that name). To identify the Red Bellied Woodpecker, look for the black and white bars on the back, plain pale brown on the underside, and characteristic red streak on the top of the head. This red streak will run from the nape ("shoulders") all the way to the top of the beak in adult males, but will only extend from the nape to just behind the eyes for the adult females. The juveniles will have little to none of this red streak. Like most woodpeckers, the Red Bellied Woodpecker nests in tree cavities. They pick out dead or rotting trees which have weak woody tissue and hollow out a place to build a nest. 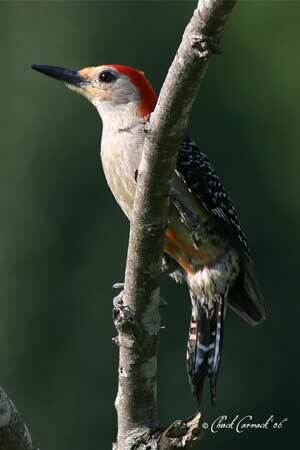 Red Bellied Woodpeckers eat insects. They use their beak to glean through the bark of trees in search for bugs. To attract this bird to your backyard, make sure you have mature trees in your backyard. Trees that are at least as big around as a small dinner plate work best. Try not to cut down trees that are dying or to take down dead trees unless they are an immediate danger to your safety or the safety of others. Woodpeckers along with other birds such as raptors (hawks, eagles, falcons) often use these trees to perch or nest in. At Wild Bird & Garden, we stock some perfect snacks for Red Bellied Woodpeckers. As far as insects go, we stock live and freeze dried mealworms. We also have a selection of suet cakes that are perfect for this species. These birds may also come to fruit that has been set out. It is a possibility that these birds will try to nest in your bluebird box. Most woodpeckers in our area will enlarge the hole slightly by pecking to accomodate their larger size. Although it may seem that they have ruined your box by doing this, it will be worth it if you can see the babies hatch! Don't fret either, at Wild Bird & Garden we stock some supplies to fix your bluebird box once your woodpeckers are done nesting. Red Bellied Woodpecker adult. This individual is most likely female because the red streak on its head does not extend all the way to the beak.